Human resource department is probably the most critical department of a business or organization. Human resource manages and controls the employees within an organization. It motivates the employees so that higher productivity can be achieved. The HR managers need to keep track of various things. From initiating the process of human resource management to monitoring employee performance, payrolls, and legal compatibility – HR managers perform a series of tasks. The job should be well defined, and that is why an organization needs to have HR Manager Job Description Samples. The job of an HR manager should be well defined, and thus, one needs to opt for the human resource manager’s job description sample. Here is the sample description for you, available in PDF format. Human resource management is a critical task and thus, a well-versed manager is required to take care of this job. 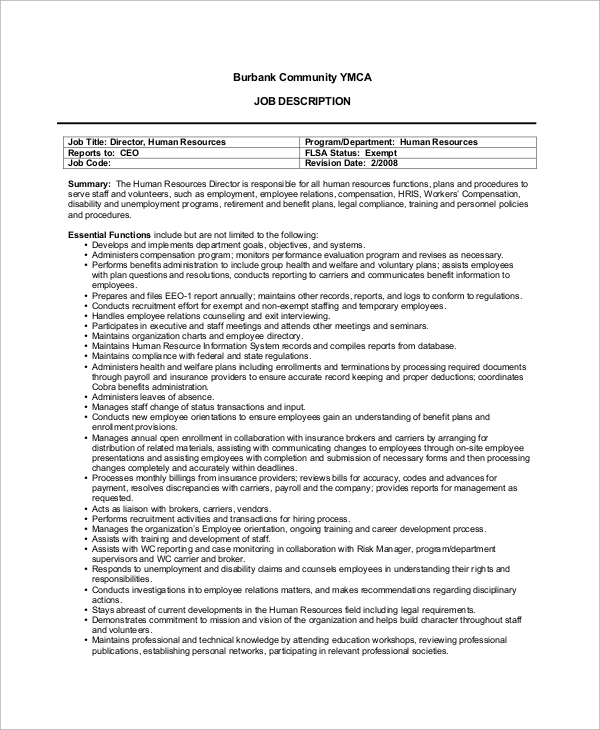 For human resource job description, one can use this online sample. Human resource planning is important to keep a business productive. For setting up a healthy work culture, the value of human resource department should not be undermined. 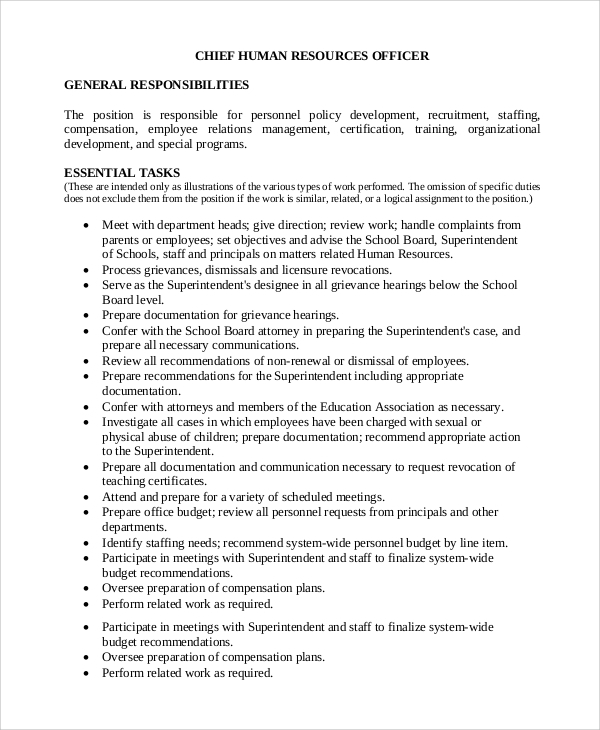 Here is a sample write-up for the human resource job description for you. 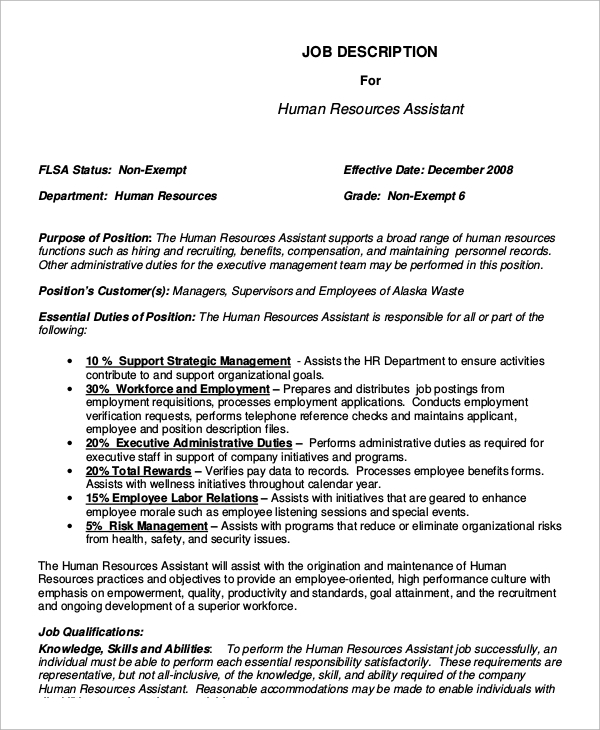 The job description of a human resource assistant has to be well defined. 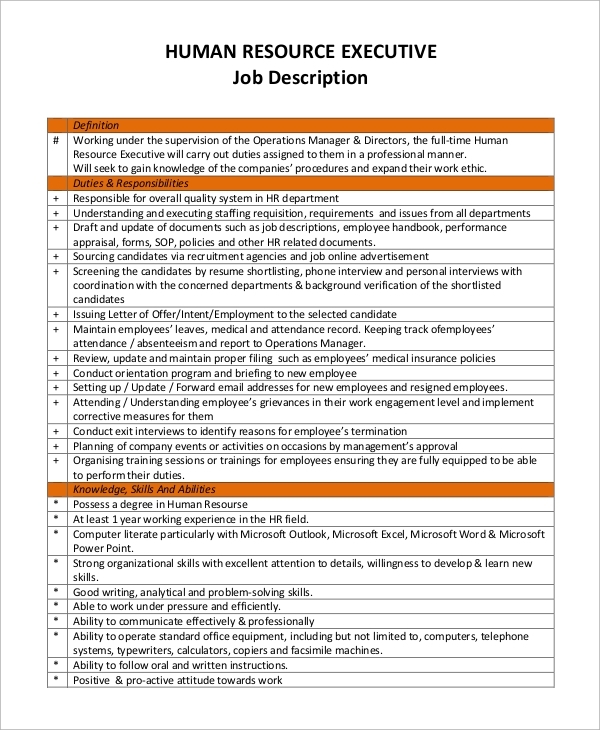 For recruiting such an individual and directing him/her with a structured job role, this sample job description writing can be used. 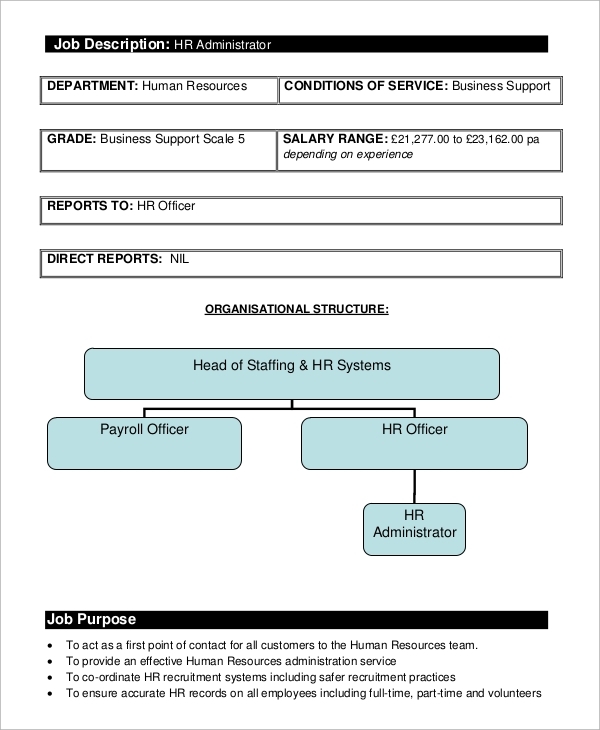 The job of a human resource administrator should be properly defined. If the job is not perfectly described, it can create confusions. This is why this PDF job description sample should be used. Human resource planning is the most crucial part of an organization. For handling the job of human resource planning as well as management, a company needs to hire professional individuals. For that purpose, a job description has to be well written. The job description is typically written for carrying out the task of recruitment and interviews. After reading the job description, potential applicants apply for the job. The job description also directs an employee to perform his/her job in a structured manner. It should provide directives to the employees on their job roles, performances, and responsibilities. 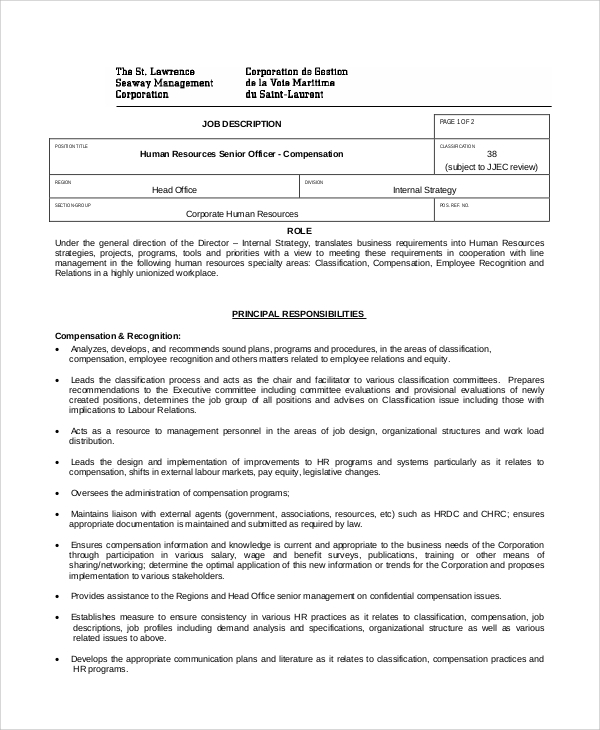 Create Job Description Templates for the HR managers easily with the online job description samples. Who Should Download The Online Job Description Samples? Job description needs to be written by the employers who intend to hire a particular individual for the responsibility of a specific job. 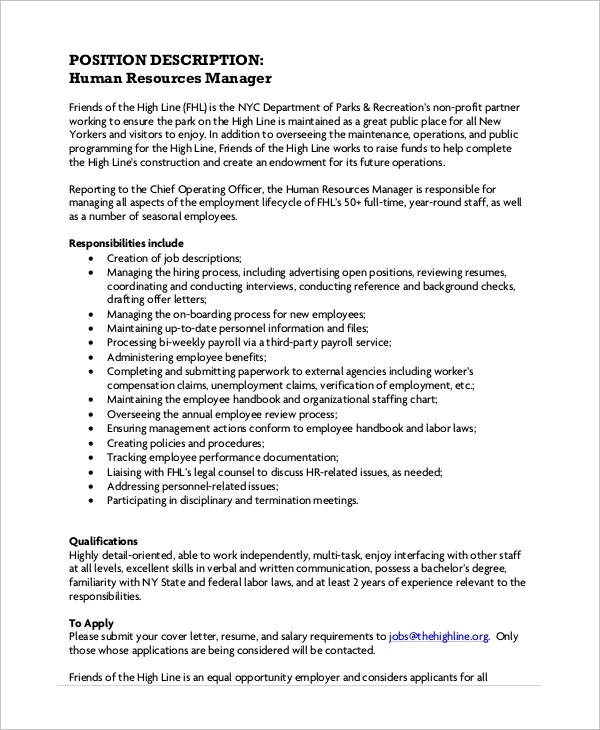 For the HR management job, it is important to hire a person who possesses the knowledge, qualification, and experience in the role of human resource planning as well as management. The process of human resource management is simple as well as useful for every organization. However, depending on the organization, job role may vary. This is why the HR job responsibilities should be well defined for an organization. You can use the online samples to create job descriptions for the HR managers. You can also see the Cashier Job Description. Human resource management job is crucial and should be left in the hands of the professional as well as experienced human resource planners or managers. For effective human resource management, organizations need to define the jobs as well as the responsibilities of its human resource managers. For the HR job description, samples should be used.